This dish is the ultimate reminder of the food I grew up eating in France. When baked, tomatoes become incredibly sweet. 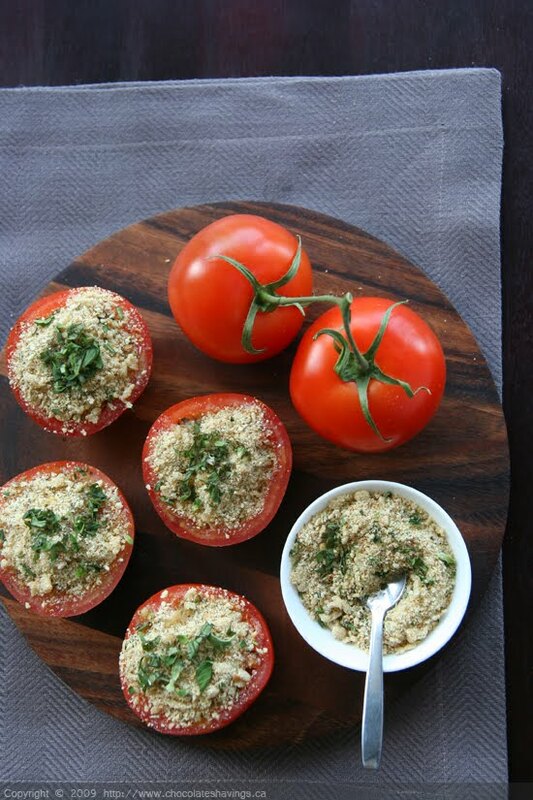 These are filled with breadcrumbs and herbs which complement the juicy tomato flesh. I like to serve these alongside roast beef, braised lamb or lemon sauteed sole. This dish is best enjoyed when tomatoes are at their peak, and with homemade coarse breadcrumbs... but realistically, you can't always make that happen. They are also delicious with store-bought breadcrumbs, and, in the middle of the winter, it's a nice reminder that spring is just around the corner. This photo was taken before these tomatoes went in the oven... and once cooked they disappeared before I had time to shoot them! Preheat your oven to 375F. Lay out the tomatoes seed side up, in a large oven-proof baking dish. Scoop out some of the seeds to make more room for the breadcrumbs. Sprinkle with salt and pepper. In a small bowl, mix together the breadcrumbs, garlic and parsley. Using a small spoon, fill the tomatoes with the breadcrumbs mixture. Drizzle with some olive oil and bake for 30 minutes or until the tomatoes are softened and the breadcrumbs are golden brown. Serve immediately. Enjoy! My mom made these sometimes. Hers were very garlicky and delicious. Yours look delightful as well. What a great reminder of a recipe I have long forgotten about. Yum! Roasting tomatoes is one of my favorite ways to increase and concentrate their flavor and this recipe sounds like an awesome way to do just that! Thanks for sharing - I can't wait to try this one! My husband's family has made these for years so consequently so have I. I think they go with just about anything. Your recipe is almost identical to ours. Nothing beats Tomatoes Provencale. Deliciosos tus tomates. Feliz fin de semana and hello from spain. They look delicious. Thanks for sharing. If you get a chance, please visit my blog. I am having a giveaway. Enjoy your weekend. These look so fancy! I love how this simple dish can look so decadent. Love Tomatoes for healthy cooks and every day I always add the tomatoes in my cooking. They look delicious! I can understand why they disappeared so quickly! Mmm I love tomatoes provencales. They're so simple and really highlight how delicious tomatoes really are when fresh! I think I'll be making lot's of them now this summer. So pretty! Those tomatoes look wonderful. Thanks for this tomatoes provencales recipe. They sound (and look!) wonderful. This is one our fav .. it's so easy to make and always tastes awsm! These are stunning! Love the simplicity... and I can just imagine how great the tomatoes must taste.